Above: The Wewoka Biogas project. NEW YORK, Apr. 22 /CSRwire/ - This Earth Week marks Designtex's second year of carbon neutral operations. Coinciding with their 50th Anniversary, Designtex is the only contract textile distributor to achieve a net zero operational footprint in its role as a major supplier to an increasingly green building market. Designtex has continued its partnership again this year with NativeEnergy, a leading provider of carbon offsets, renewable energy credits, and carbon footprint consulting. NativeEnergy assessed Designtex's total operational footprint for 2011 according to the World Resources Institute's (WRI) Greenhouse Gas Protocols. The resulting footprint of 4075 tons of CO2 emissions this year includes all Designtex facilities' energy use, business travel, freight (inbound and outbound shipments), employee commuting, and waste. A summary of the report is available on Designtex's website, www.designtex.com. Of the total footprint, the majority (3341 tons CO2) will be offset through investment in the Wewoka Biogas Project, with the remaining tons (734 from electricity use) to be balanced through Green-e certified renewable energy credits (RECs) from Midwest wind power. Jeff Bernicke, President of NativeEnergy, said: "Designtex's commitment combined with decisive action is exemplary. Their purchase of offsets from the Wewoka carbon project is truly helping to build that new facility. NativeEnergy is pleased to include them as a Project Supporter of Wewoka Biogas Project." The Wewoka Biogas Project is an innovative "fenceline" project that establishes a landfill gas-to-energy system in rural Oklahoma. 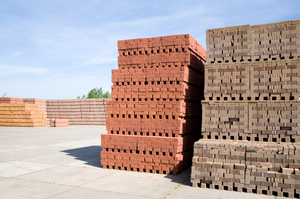 The Commercial Brick Corporation has been producing bricks in Wewoka since 1925. Traditionally relying on expensive natural gas for fuel, owner Bob Hartsock realized that the highly potent greenhouse gas methane being released from the landfill next door could be captured and used to power his kilns. NativeEnergy's innovative Help Build carbon offsets allow Designtex, among other companies, to enable the construction of this community-based project. The Wewoka Biogas Project will be verified to the Voluntary Carbon Standard to show that approximately 25,000-30,000 tons of CO2 equivalents per year will be prevented from being released to the atmosphere. When it becomes operational in summer 2011, the project will connect Designtex to real bricks (if not mortar) that will be used to build homes and businesses throughout the United States. Tom Hamilton, President and CEO of Designtex said, "Designtex is proud to operate at net zero carbon, and we will continue to address the pressing need for renewable energy sources and greenhouse gas reductions through our actions." Designtex is a design and product development firm that celebrates inquiry and collaboration. A Steelcase (NYSE:scs) company, the Designtex family of products includes: Designtex (textiles, walls, panel fabrics, drapery, cubicles and digital printed surface imaging), Fusion (architectural panels) and loophouse (custom hand-made rugs). Designtex maintains showrooms, offices and sales locations in 110 global locations. For more information call 800-221-1540 or visit designtex.com.